Consider what can happen when a hose bursts. If you are lucky, you will only have nuisance repairs to electronics, engine or interior. 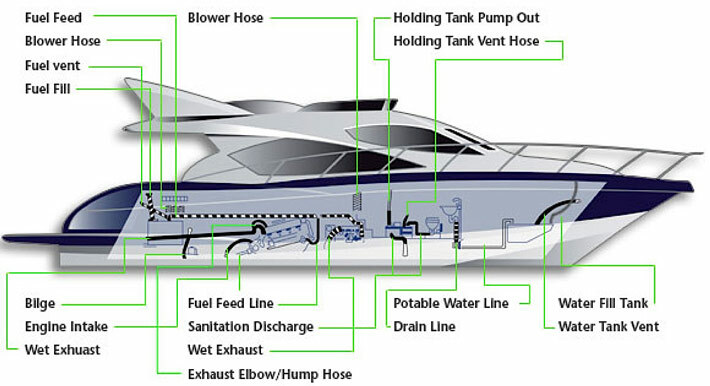 If fate has it in for you, a defective hose can cause a stink if it’s the discharge of the head, cause a fire if it’s part of a gas line or even sink your boat if it’s connected to a thru-hull fitting. That’s why we recommend spending a little more on a high-quality marine hose that offers more durability and better performance in critical applications and why you should inspect your hoses frequently for signs of deterioration. What Fluid or Application Do You Need the Hose For? Your application will determine what kind of hose to purchase. Our selection of hoses encompasses most applications and is available in any length from a foot up. Maximum standard length is 50' but Special Orders can be made for greater lengths. The following is a guide to match hose and application. Intake hoses ingest “raw” or outside water to cool the engine, flush the toilet, feed the AC and supply fresh water for the fish in the bait tank. Use only hose recommended for “below waterline” connections with a hard spiral that prevents kinking and collapsing under suction should the screen of the intake become clogged. We recommend two-ply pickup hose with heavy-wall rubber and helix reinforcements or extra heavy-duty smooth vinyl hose with a hard PVC helix for non-heat sensitive applications. The Series 135 Heavy Duty Water Hose that is polyester yarn spiral reinforced and pressure resistant to 800psi is a good example. Engine coolant and wet exhaust hoses circulate and discharge engine coolant water, and must resist kinking, engine heat, exhaust fumes, chemicals, antifreeze, ozone and seawater. For these reasons we like to use heavy wall, two-ply hoses or quality heater hoses. Wet exhaust hose consists of heavy-walled synthetic rubber and is covered with multiple plies of synthetic cord. Drainage hose for cockpit, sink or shower needs to be flexible with strong walls and resistance against kinks and abrasions, but since they are under positive pressure, they may not have a helical wire. Potable water hoses must be made of FDA-approved, non-toxic materials so they won’t cause bad taste in drinking water supplies. Pressurized systems must use reinforced hose to withstand pump pressure (approx. 40–60PSI). For fill and vent hoses in water tanks, extra-heavy-duty sanitation/water hose should be used, while reinforced rubber hose is the best choice for hot water up to 140°F. Alternatively, you may use a reinforced vinyl hose reinforced with nylon braid. Examples include: Series 162 (polyester reinforced clear PVC hose), FDA approved; Series 140 VAC Standard (steel wire reinforced PVC hose); and Series 148 Multi-Purpose (vinyl helix hose) FDA approved, ideal for critical drain and fill applications. Bilge pump hoses typically use corrugated polyethylene with molded cuffs because it is flexible, economical and resists oil, solvents and other waste that collects in the bilge. For better flow you should choose a hose with a smooth bore, abrasion-resistant cover and good anti-kink flexibility. Examples include: Series 148 Multi-Purpose (smooth-walled vinyl helix hose) FDA approved, ideal for critical drain and fill applications, and Shields Multiflex Hose (Series 141). Of the corrugated hoses, the best is Shields VAC Standard (Series 140) and Bilgeflex (Series 120). Sanitation hose has to be tough, flexible and resistant to odors and toilet chemicals. Choose hose with a smooth bore, heavy wall and specifically labeled for sanitation use. 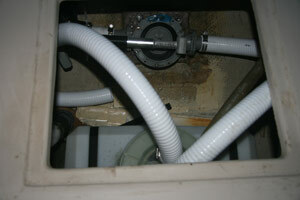 There are two choices: white vinyl hose and sanitation hose. Both will eventually smell. We recommend only smooth interior wall hose because corrugated types trap waste and restrict flow. Rigid PVC does not pass odors but is stiffer and more difficult to route and does not connect directly to pumps and thru-hulls. Still it is possible to plumb part of the system with rigid PVC, switching to hose where necessary. Reinforcement: Many hoses have reinforcement in the walls for strength and rigidity, and to prevent collapse or expansion under pressure. The reinforcements can be wire, yarn spiral or PVC/vinyl helix. Burst strength: Hose used for discharge lines has to resist pressure. This so-called burst strength, measured in pounds per square inch (psi) depends on product design and diameter; small diameter hoses have greater burst strengths. Hose with multiple plies or helical reinforcement has greater pressure limits, which is important for pressurized water or exhaust applications. Vacuum rating: Hose on the intake side has to withstand suction, a property that is measured with a so-called vacuum rating. Intake hose should have a vacuum rating of 20 or higher. Temperature range: Mostly critical for engine cooling hose, but might also be important for pressurized hot water systems. FDA-approval: Hose used in potable (drinking) water systems must be constructed from safe, non-toxic materials that are contamination- and corrosion-free. Bend radius: For proper installation a hose should not be bent more than the minimum bend radius recommended by the manufacturer to avoid kinks and breakage. Especially important for sewage lines and bilge pump applications. Sometimes a lubricant is needed to install a hose onto a fitting. What Is the Right Hose Diameter? Bilge pumps: 3/4", 1 1/8", 1 1/2", or 2"
Gasoline feed: 1/4" to 3/8" depending on engine size. Hose clamps are stainless bands that compress hose around barbed fittings. They can be made from a variety of metals, but quality ones are all stainless steel, including the screw, band, and other parts. T-Bolt hose clamps are much stronger and have a 360° clamping surface. They are used in applications with high pressure, heat, vibration, or other severe requirements, like exhaust systems. Two clamps are recommended for below-waterline connections. Thru-hulls, hose lube & sealant, etc. may be necessary to make a hose fit and complete the plumbing system. Most boats use flexible vinyl or rubber hose and barbed fittings secured by hose clamps. You may find it easier to install hoses over barbed fittings if you place the hose in hot water first and use liquid soap as a lubricant. Threaded fittings should be wrapped with thin plastic Teflon tape or some other sealing liquid prior to assembly, to seal tiny gaps in the threaded connection. In household applications, plastic pipe and fittings are solvent welded with PVC pipe cement. This technique is not recommended on boats because pounding and vibration might cause fatigue and failure of these connections. Use double hose clamps on hose to pipe connections below the waterline for extra security. Make sure to use hose barbs long enough to give both clamps some gripping surface. Connect fittings of the same material within a system because thread styles and inter-thread distances will match. In addition, rigid bronze fittings have been known to split weaker plastic fittings when they are being tightened. Normal green color is not a problem on an aging bronze fitting. A pink or red color, on the other hand, is an indication of galvanic corrosion.